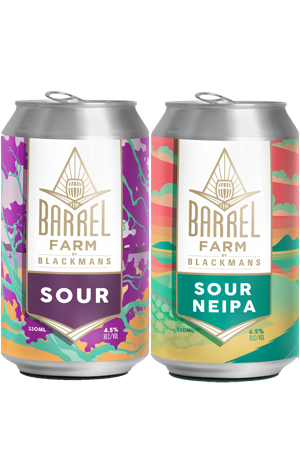 Barrel Farm is a new side project from Torquay's Blackman's Brewery, where the brewers get to indulge their love of Old World blending and brewing. Apparently, inspiration dates back to a first visit to Cantillon in 2012 and, seven years later, has been launched with two beers. You wouldn't mistake either for a Cantillon beer, but you would find common ground with the sort of beers upon which Renn Blackman and team have built their reputation, as both Sour and Sour NEIPA work in subtleties more than bold statements. The former, despite being fermented on French oak, shares a lot of characteristics with the fine line of goses to leave the brewery in the past couple of years. The barrel time adds a fullness to the texture as well as a hint of vanilla, while the local seawater and Mosaic and Simcoe hops are responsible for a lick of salt and light, fruity aromas in what's a far more easy-going beer than the name might suggest. As for its NEIPA partner, the nose is all punchy tropical juices, with the sour side only really becoming apparent on the palate, contributing a livening tang that cuts into the full, sweet, textural hoppy fruitiness. Dig a little deeper and you'll pick up the final flourish: gin-soaked cucumber, mint and lime added late on, inspired by The English Garden cocktail.